Mohnish Pabrai, Managing Partner of Pabrai Investments, gave an illuminating presentation at this year's 2nd Annual VIC in New York City. Titled, "Dhandho! Low Risk+High Uncertainty = Ultra High Rewards," Mohnish brilliantly illustrates the rise of the Patels in the U.S hotel industry. Coming as refugees from East Africa, the Patels were filled with entrepreneurial spirit and nothing to lose. By buying small motels, living in the motels, and staffing the motel with family members, the Patels were able to reduce overhead costs down to the bare minimum (low risk). This low cost structure gave the Patels one of the most prized attributes in all of business: a sustainable competitive advantage. Patels had no idea how their model would work out (high uncertainty), but they did know that they had no downside (the hotels were highly leveraged). Mohnish referred to this as The Patel Motel Dhandho model (clever choice of words). So how did this model turn out? Collectively, Patels own over 33% of all U.S hotels (about 20,000) or so worth over $40 billion. Essentially what Mr. Pabrai is illustrating is the arbitrage spread that exists due to a gap that start ups step in to fill. In the Patel case, because they were able to operate with the lowest costs, they were able to provide the lowest prices and so they generated super sized returns. Like all arbitrage opportunities, however, over time the gap diminishes. As Patels applied their model on a larger scale, the profits eroded and the gap diminished. In this situation the gap persisted long enough for a lot of Patels to make a lot of money. This talk contained valuable nuggets of information that are essential to any long-term investment philosophy: seek out companies with sustainable advantages and you don't need to take on higher risk to generate higher returns. Mohnish's Dhandho model is a powerful frame work for all equity investors to use. Welcome to Sham Gad on Value Investing: Inspirations from Ben Graham, Warren Buffett, and Mohnish Pabrai. This is my blank canvas. My goal is to periodically paint strokes on this canvas as I pursue my lifetime goal of running Gad Investment Partners, a private investment partnership modeled after the original Buffett partnerships that begin in 1956. According to Warren Buffett, the most important skill an investor needs to possess is temperament. Charlie Munger has said that "all intelligent investing is value investing." 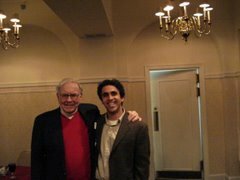 I first heard about Warren Buffett in 1994 when I was 15. After reading Roger Lowenstein's biography on Buffett and Graham's "The Intelligent Investor," I became a student of value investing almost religiously. I say almost because I encountered a few slip ups early in my investing endeavors. Fortunately for me, these mistakes occurred early in my life with the little savings I had. Sometimes the best investment strategy is to have no strategy at all. Valuable lessons can be learned from observing successful long-term investors. This group includes the original master craftsmen (this is certainly not a complete list), Buffett, Munger, Bill Ruane, Christopher Brown, Walther Schloss and their disciples: Joel Greenblatt, Mohnish Pabrai, Bruce Berkowitz and Eddie Lampert.